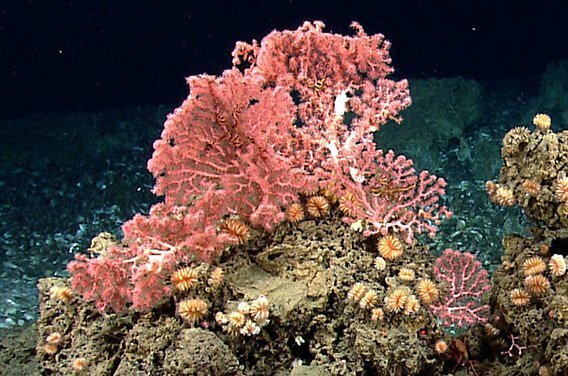 At its meeting today in Wakefield, MA, the New England Fishery Management Council (NEFMC) Habitat Committee is discussing options for the Deep-Sea Coral Amendment, including a revised Option 7 broad zone management area. The revised Option 7 broad zone was drawn based on heat maps of fishing effort developed from vessel monitoring system polls, combined with data on deep-sea coral predicted habitat, areas of steep slopes, and coral observations. In areas with fishing and corals, the zone is at approximately 500 meters depth. In areas with fishing effort and limited coral habitat, the depth is deeper, approximately 550 meters. When fishing activity is distant from the boundary, the boundary is moved shallower to track the footprint of predicted coral habitat. The interactive maps on the Northeast Ocean Data Portal have been updated to include the revised Option 7, as well as other options under consideration.